Cho Yung Plus is the latest product to be released from the people who brought us Cho Yung Tea and and Coffee Activ. As a company Cho Yung have been in operation since 2008 and have a good reputation, particularly in the UK where their products are regularly stocked in high street stores such as Holland Barrett. Cho-Yung Plus is a different direction for them it would appear, the usual one ingredient approach (green tea / green coffee) has been replaced by the multi-ingredient angle. 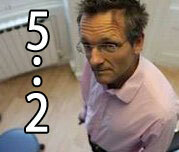 Claims: To work on many levels of weight loss, claims also to reduce cholesterol. As far as weight loss goes, the only benefit the product appears to offer is its proclaimed ability to suppress the appetite, but appetite suppression alone is seldom enough to facilitate worthwhile results in any but the most determined of dieters. If the other claims hold true though, the product may offer other worthy health benefits. Cho-Yung are probably better known for their range of weight loss herbal teas, and teas are produced in a very different manner to diet pills, but the company also produce colon cleansing pills; so perhaps a product such as this not so much a departure from the norm as it at first appears. The company headquarters is based in Cyprus, but Cho-Yung products can found on the shelves of many stores, including Holland & Barrett, and it seems likely that Weight Loss Accelerator may become available to buy from Amazon at some time in the future because the Amazon website already contains a profusion of their teas. 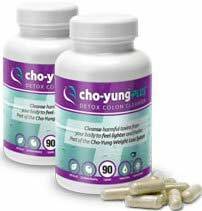 Although Cho-Yung Plus Weight Loss Accelerator may provide appetite suppression, the name is apt to cause buyer confusion because it is not a dedicated weight loss product. 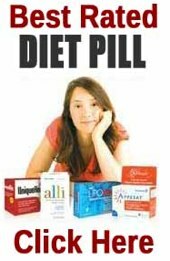 This may make the capsules a poor option for users whose primary goal is weight loss, but if the capsules fulfill the other promises made for them they may be an ideal option for anyone who wishes to purge their body of unwanted toxins and improve their overall state of wellbeing. Cho-Yung attribute the blend’s appetite suppressant qualities to the inclusion of psyllium husk powder (pictured left). This is a high fiber ingredient derived from the seeds of an Indian plant called plantago ovate, but although psyllium husk is believed to act as a laxative, and some evidence also suggests it may lower cholesterol, its reputation does not stretch to appetite suppression and its use may entail side effects. Cayenne pepper is also included in the blend. 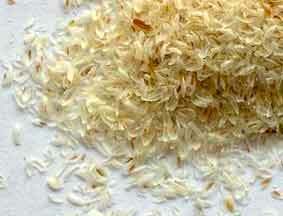 It is a proven fat burner that can also lower cholesterol. The amount included here (5g) is probably sufficient for cholesterol control, but will do little to aid a sagging waist line. The rest of the ingredients may have the ability to fulfill some of the product’s other promised benefits, but will be of little interest to anyone with a serious desire to lose weight. Although it is possible to find a respectable level of customer feedback about some of Cho-Yung’s other products, especially their teas, it has not been possible to find to find any customer response to Cho-Yung Plus Weight Loss Accelerator. Psyllium husk has proved to be problematic for some users and its use may cause stomach cramps and contribute to the build up of intestinal gas. Serious allergic reactions are possible, but rare; and the range of possible side effects suggests medical advice may be advisable before use. This product will probably be unsuitable for pregnant and nursing mothers. Cho-Yung are reputable company, and Cho-Yung Plus Weight Loss Accelerator is a lot kinder to the customer’s pocket than many other dietary supplements, but the list of included ingredients suggests the pills will provide little or no weight loss benefit to the majority of users, unless overeating is their major dieting let down and some other form of weight management program is already in place to assist them with their fat burning requirements. The product may be of more benefit to customers who require a detox, and will not doubt be likewise advantageous to people who need to get their cholesterol level under control before other health issues become apparent. The health benefits of aloe vera are well known and its presence alone may be enough to facilitate adequate detox benefits; and garlic is a natural antibiotic, so its presence is also beneficial and although some form of medical advice may be advisable before use, Cho-Yung Plus Weight loss Accelerator is not by any means a bad product. It is, however, a victim of bad branding and marketing that can only hope to attract the attention of a totally unsuitable user group. A single bottle of 100 capsules lasts for a month and costs £29.98, but significant savings can be made by customers who buy two or more bottles, with the best deal being provided to those who buy eight bottles for the price of four, but purchases do not appear to be protected by a money back guarantee. Cayenne pepper is the ingredient that is of most interest it is an excellent fat burner. It is only recently that the fat burning potential and benefits have been harnessed by the industry. 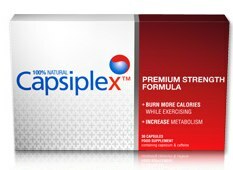 Capsiplex is the original exponent of this methodology with its ‘chili diet pill’ being of the best selling commercial diet pills of all time.